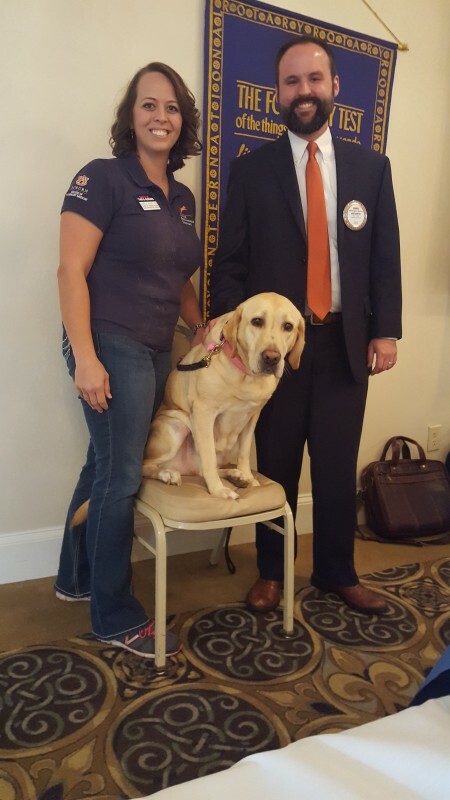 On Wednesday, Sept. 13, the Auburn Rotary Club hosted Pam Haney of Auburn University’s Canine Performance Services —and her canine friend, Lily. Haney, who serves as CPS’ breeding program manager, discussed with Rotarians how the program is striving to breed and train “man’s best friend” so he also can be man’s frontline defense by detecting threats commonly associated with biological, explosive and other terrorist attacks on the battlefield and in domestic locations like airports and large-audience events. Pictured with Haney is Club President Chris Warren. The Auburn Rotary Club meets each Wednesday from noon to 1 p.m. at Saugahatchee Country Club. For more information about the Auburn Rotary Club or how to become a member, visit www.auburnrotaryclub.com.